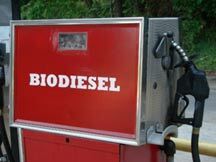 Thank you for your support by providing us with used cooking oil for our Biodiesel production process! At White Mountain Biodiesel we have met and exceeded all the EPA & ASTM 6751 standards producing 200,000 gallons of Biodiesel every two weeks! 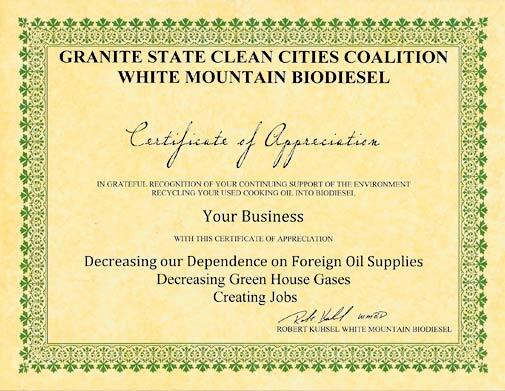 Our commitment to the environment has established us as a stake holder with the Granite State Clean Cities Coalition giving us the opportunity to participate in a Certificate of Appreciation program that you can display in your establishment letting your customers know that you recycle. Again, thank you for providing us with the oil that we need to produce this important product.